Don’t missed out the Tealive Buy 1 Free 1 promotion. 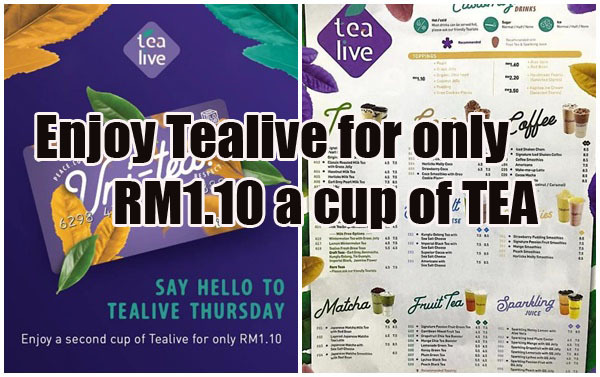 Tealive today introduced the discounts purchase for second cup of tea for only RM1.10 per cup. This promotion is only available from 3PM – 6PM every Thursday, you will only need RM1.10 for a second cup of tea when you asked your friend to join you for a tea. This promotion is limited to card members (Chatime card can still be used). WOW! Only RM1.10! Too cheap! Share with your friends right away now.